Support 10 feet of Streets Alive! 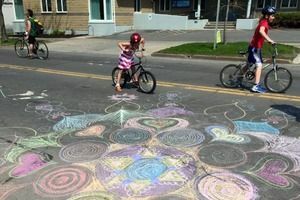 Support 25 feet of Streets Alive! Support 50 feet of Streets Alive! & get a reflective leg band. Streets Alive! Ithaca is part of a growing movement to make walking and biking safe and convenient for everyone in Tompkins County. Streets Alive! 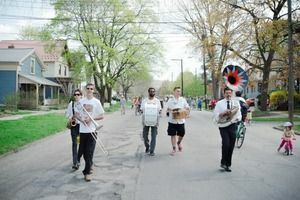 draws crowds from near and far to celebrate all modes of active transportation and Ithaca’s vibrant community. 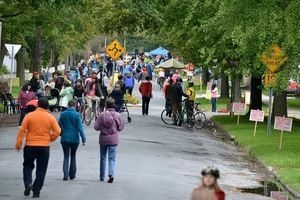 About one mile of city streets are transformed into public space for four hours on one Sunday in May and September, welcoming bikers, walkers, strollers, dancers, artists, kids, and people of all ages. Streets Alive! costs about $1 per foot of event space. Bike Walk Tompkins is raising funds to cover event expenses for Streets Alive and demonstrate strong community support for biking and walking. Event expenses include transportation for gear and barricades, staffing, local bands, insurance, volunteer food and t-shirts, printing and outreach, and more. 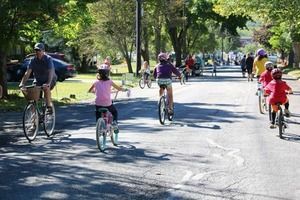 Invest in safe and enjoyable biking and walking in Ithaca with your donation to cover costs of one Streets Alive! events with the vision of more car-free days in the future. Please donate today! Streets Alive! is currently made possible with the generous in-kind support donated by Bike Walk Tompkins, community donors like you and with grant funding from the Park Foundation and the Tompkins County Tourism Program. See our sponsorship booklet to learn about how your organization can support Streets Alive. Click here to learn more! Bike Walk Tompkins seeks to influence and change the culture and infrastructure for biking and walking in Ithaca and Tompkins County so that many more people can embrace active transportation in their everyday lives, and so that our community reaps the multiple health, environmental, economic and social benefits associated with strong active transportation networks. 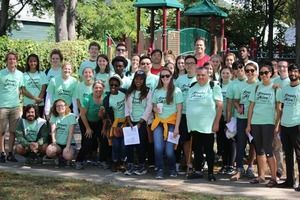 Bike Walk Tompkins was formally established in May 2014 and hired its first staff person/program director in July 2014. Bike Walk Tompkins is a project of Ithaca Carshare, an active 501(c)3 non-profit, which accepts donations on behalf of Bike Walk Tompkins.